WARM INDIAN SUMMER DAYS & SPIRITED NIGHTS ARE CALLING! We invite you to indulge in our passion for good food. Artwork of all kinds fills Grand Rapids for a huge annual celebration of creativity where visitors choose the winner of the $250,000 prize. Twenty-four Saugatuck-Douglas painters contributing to the 150-square-foot ArtPrize entry called "Re-View: Saugatuck Douglas" that will hang in The B.O.B. in Grand Rapids for the third annual art competition opening in September. The world's largest Art Prize h-m-m! The 15-by-10-foot re-creation of the iconic work of art school painters along the Kalamazoo River is bringing together creative talents that are sometimes divided by that very river. Preview screening for Ken Burns' "Prohibition"
The film that cost 20 trillion dollars to produce. 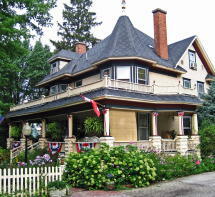 The 2011 Heritage Festival Home Tour celebrates the charming village character of Douglas, Michigan. The buildings opened for this special event are modest in size but ideal for today’s "small is beautiful" design and living sensibilities - and they range in time from the village's oldest (1851) to stylishly contemporary. 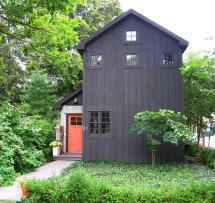 Crow Cottage, 31 Spring Street -- built 2007 on a very narrow lot smack in the middle of the village, this small, contemporary, open-plan, owner-designed house features interesting wood finishes and use of concrete block, upper sitting porch with fireplace, and a striking art collection. An enclosed garden leads to an even smaller guest house behind, called "The Bird". Kirby House, 294 W. Center Street -- built in 1890 as a Queen Anne style house, originally was the private residence of Frank and Sarah Kirby. Mrs. Kirby and daughter later converted it into a guest-house, and eventually it became Douglas' first hospital. In the 1980s it underwent extensive restoration/renovation to become a Victorian jewel. Time to visit Crane Orchards to “pick your own” apples! Then go to their Pie Pantry for terrific soups, homemade pies, cider and cider doughnuts. In the orchard are, Ginger Gold, Honey Crisp, Gala, Mutsu, Fuji, Ida Red, Empire Golden, and Cortlands. They are great for apple pies, applesauce, cobblers, crisps, strudels, and cider. It’s a fine time of year and we live smack in the center of Michigan’s Fruit Belt with orchards all around us. "The best show in Saugatuck debuts with autumn’s foliage." After a year’s absence and another sold out summer on the East Coast and Europe, Michael Holmes is delighted to bring his award winning production of The Judy Show back home to Saugatuck's Red Barn Theater for one night only. A modern romantic comedy about a marriage and a dog. Hilarious! Three days of Wild Goose Chase 5K and 15 K Runs, Pet Contests, Parades, King and Queen Pageant, Carnival Rides, Arts and Craft Show, Historical Lectures, Goose Calling Contest, and Food Stands. Exhibit honoring Saugatuck’s internationally famous local artist, Bill Olendorf with the Family’s Private Art Collection. A rare opportunity. • The Summertime Market for everything from Creswick farm raised cuts of meat to local eggs, goat cheese and produce. Open daily. • The SCA Green Market Highlights Farmers with produce and nurseries with flowers and trees. Every Friday from 8 am to 2 pm. • The Holland Farmer’s Market abounds with stands from early Spring until the frost. Arrive early, it’s crowded. Every Wednesday and Saturday morning. "Don’t be afraid to go out on a limb. That’s where the fruit is." "It's the simple things in life that are the most extraordinary!" Indian Summer is in the air - we look forward to seeing you!